The trail rises just beyond Atapuerca, climbing one last fold of earth along the edge of the foothills. 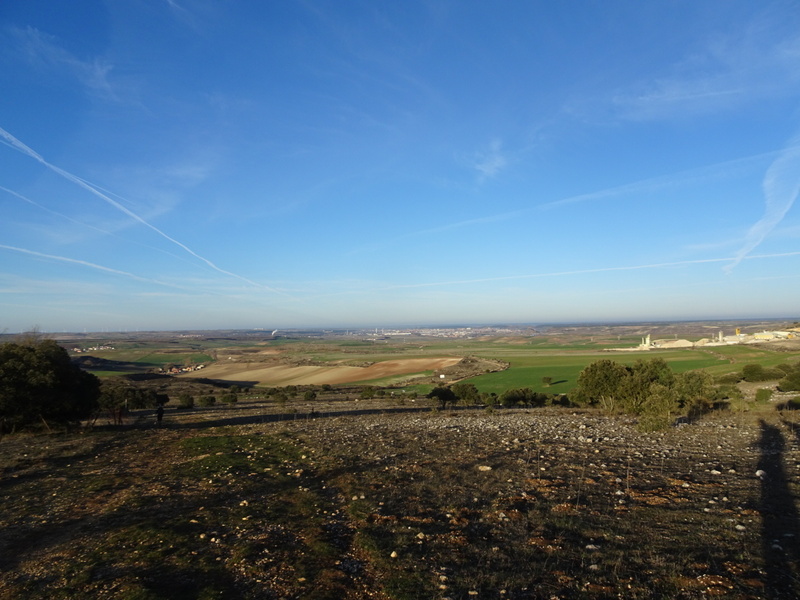 A cross stands at the top, overlooking the flat plain that stretches to the horizon. The sun hangs low in the sky, catching the clouds, lighting their edges on fire. A thousand years of pilgrims have stood here, staring at the plains laid out into the distance, relief flooding into them. They walked a harder road then. Storms rose without warning. Lords and tyrants controlled the land. Thieves and bandits prowled the forest. They had no fancy shoes, no satellite maps, no text messages and libraries of research in the palm of their hands. But still they knew that at this cross, on this hill, that the long Spanish plains waited. Flat, fast roads. The warmth of the low lands. The richness of grain fields. They stood and stared at the easiest possible path toward Santiago. I stare off for a moment too, watching the sun paint the sky, trying to imagine what it would have been like then, but I’m distracted by sunset, by the colors shimmering, by the moon rising behind me. Did those pilgrims even care for such things? Was a sunset still magical when night meant danger, meant city walls would close, meant thieves waiting with long daggers in the dark? I wonder and stare and imagine a world a thousand years apart from my own. I want to say they’d see it, that a sunset is beautiful by definition, not privilege, but I don’t believe it. I think most would have been indifferent, too focused on a thousand other things to notice the sun’s beauty. It was light, time, a marker of a day. Sunsets are for softer, easier worlds, worlds where life isn’t threatened in the dark, where the struggle to survive doesn’t overwhelm. I’m lucky they still exist in mine. I wonder every day how different peoples’ lives are today than the world I live in. There is no excuse for missing the beauty of the sunset and sunrise when one is so blessed. D. It was definitely different a 1000 years ago. Physical and safety needs were definitely a priority as Maslow taught us but I’m sure that they were awed by the sunrises and sunsets just as we are today. Namaste. Nice reflection on the challenges of our ancestors…helps put today’s PROBLEM in perspective.